OAKLAND, Calif. -- LeBron James had a simple explanation for what stood out in Game 1 of the NBA Finals: KD. 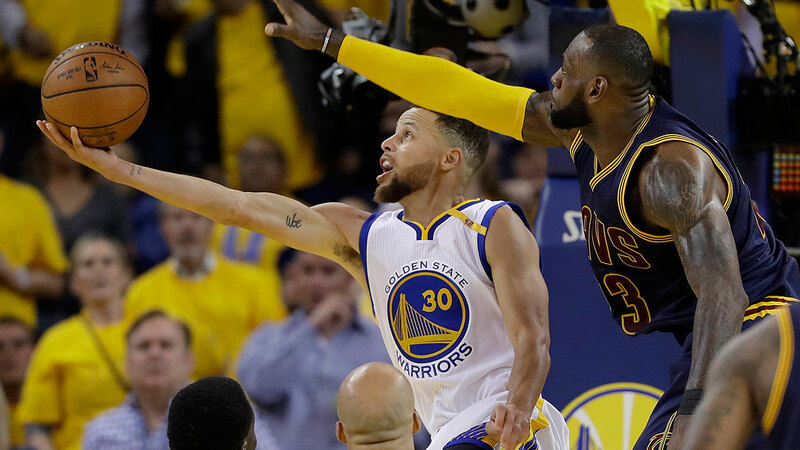 With a motivated Kevin Durant playing some of the best basketball of his career and taking the pressure off Stephen Curry, Golden State dominated Cleveland 113-91 in Game 1 on Thursday night and showed that Cavaliers-Warriors III might not look anything like the previous showdowns. "You take one of the best teams that we had ever assembled last year, that we saw in the regular season and in the postseason, and then in the offseason you add a high-powered offensive talent like that and a great basketball IQ like that, that's what stands out," James said. "I mean, it's no if, ands, or buts. It is what it is. We've got to figure out how to combat that, which is going to be a tough challenge for us. "But that's what stands out." Durant finished with 38 points, eight rebounds and eight assists, didn't commit a single turnover and spent much of the night guarding James on the defensive end in an impressive return to the Finals stage five years after his only previous trip with Oklahoma City. Durant lost to James and the Miami Heat in five games in 2012 and then James and the Cavs knocked off the 73-win Warriors in a seven-game thriller last June. "He can just go get a bucket," Green said. "That's one of the things that we need, a guy who can go get a bucket, get to the foul line. ... That's huge for us. You are talking one of the best players in the game. To have a game like that when he's playing that way, it's tough to beat. Thirty-eight, 8, 8, zero turnovers? We're real tough to beat when he's doing that." Durant played well in his first Finals trip but didn't have the help he has now with a two-time MVP in Curry, one of the league's best two-way players in Thompson and a do-it-all demon like Green. With his big output in Game 1, Durant joined Hall of Famers Rick Barry, Michael Jordan and Shaquille O'Neal as the only players to score at least 25 points in each of his first six Finals games. "This is what every player wants to be, is the highest level of basketball," Durant said. "That's what you dream about as a kid, is to play at the highest level. I wouldn't do my teammates any good if I wasn't just enjoying the moment." Durant provided a conundrum for Cleveland's defense. While the Cavs mostly left Harrison Barnes open last season and thrived when he made just 5 of 32 shots in the final three games as the Cavs overcame a 3-1 deficit to win the title, that wasn't an option with Durant. There were a handful of times Cleveland was more focused on Curry and the 3-point shooters, but Durant made them pay with six first-half dunks. His presence also forced James to work on the defensive end, sapping some needed energy he needs on offense if Cleveland is going to keep up with Golden State. Durant also did a good job defensively in his 1-on-1 matchups with James, who still managed 28 points, 15 rebounds and eight assists but also turned the ball over eight times. "Kevin's a competitor," Green said. "Obviously being that he's guarding LeBron, he's taking that challenge on. And I expect nothing less out of him, being the competitor that he is." Durant's presence also benefited Curry, who hit six 3-pointers on the way to a 28-point night. Curry shot just 40 percent in the Finals a year ago and had more turnovers (30) than assists (26) as he nursed injuries to his knee and ankle. But after winning the first two games a year ago before blowing the 3-1 lead, the Warriors aren't about to get ahead of themselves even if Cavs coach Tyronn Lue called them "the best I ever seen." "A lot of us have been through both sides of a championship run and a Finals," Curry said. "You're not going to see crazy celebrations. You're not going to see us getting ahead of ourselves. We're going to enjoy what we do on the floor and going to be passionate about it and have each other's backs when we're out there, but every 48 minutes is a separate event."